Dr. Lori Civello is a 1988 graduate of the University of Illinois College of Veterinary Medicine. She has lived in the Chicago suburbs a majority of her life (since age 4). She has 3 passions in life: caring for animals, sailing, and traveling. 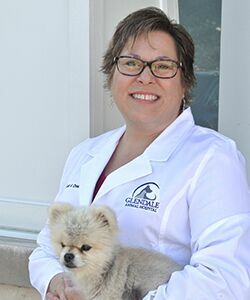 She bought Glendale Animal Hospital 20 years ago and is thrilled to be practicing in such a fabulous new building. Dr. Civello has 3 wonderful dogs: Timmy the Pomeranian who is at her side at all times, a pitbull rescue named Dino and Oompa Loompa, a bassett/golden retriever mix. They keep the 3 house cats (Charlie, Marlin, and Justin) on their toes. She has only one rule in her house: all animals that come to live at the Civello home must be “defective” or rescues. In addition to her pets, Dr. Civello shares her home with her husband of 21 years, Scott, who is a trained chef.